Garcinia Cambogia Burn is a maximum strength, highly concentrated Garcinia Cambogia weight loss supplement designed to help suppress appetite and inhibit fat production. Hailed by leading weight loss experts, as the perfect, all-natural weight loss aid, Garcinia Cambogia is a pumpkin-like fruit found in Southeast Asia, that has been used for centuries as an appetite suppressant. Garcinia Cambogia Burn is an "all in one" supplement, combating the reasons for weight gain while supercharging your weight loss, giving you 2 to 3 times the results from diet and exercise alone. Garcinia Cambogia increases the amount of serotonin, the "feel good" hormone, produced by the body. Serotonin suppresses the appetite, and decreases stress and feelings of depression, two of the causes of overeating. An added bonus - an increase in serotonin helps your mood and sleep. 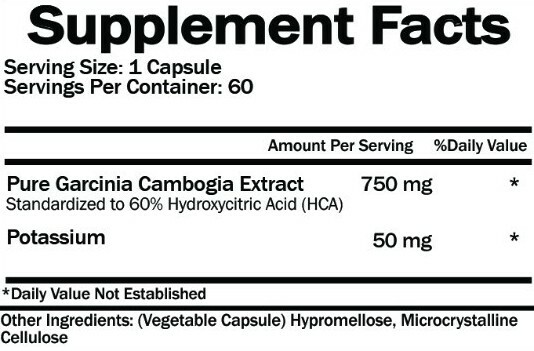 Garcinia Cambogia is a powerful fat burner, boosting your metabolism to increase your weight loss. The high Hydroxycitric content (HCA) in the extract blocks the body's natural conversion of carbohydrates to fat - not only does your body not create more fat, it will burn off stored fat more quickly! An additional health benefit - when HCA inhibits the fat-making process, it decreases the production of LDL (bad cholesterol) and triglycerides. A recent study showed subjects taking the formula in Garcinia Cambogia Burn, increased their resting metabolism, felt less hungry and lost weight with no change in their diet. With it's maximum strength, all-natural formula, Garcinia Cambogia Burn is regarded by many weight loss experts to be the most effective Garcinia Cambogia formula available for losing weight and burning fat. Take 1 capsule three times per day with a full glass of water. Best times to take are 30 minutes before each meal. If you have a tendency to snack at night, you may take a fourth capsule after dinner to curb cravings. Keep out of reach of children. Consult your doctor before taking this product if you are on any medications. Store in a cool, dry place protected from light.